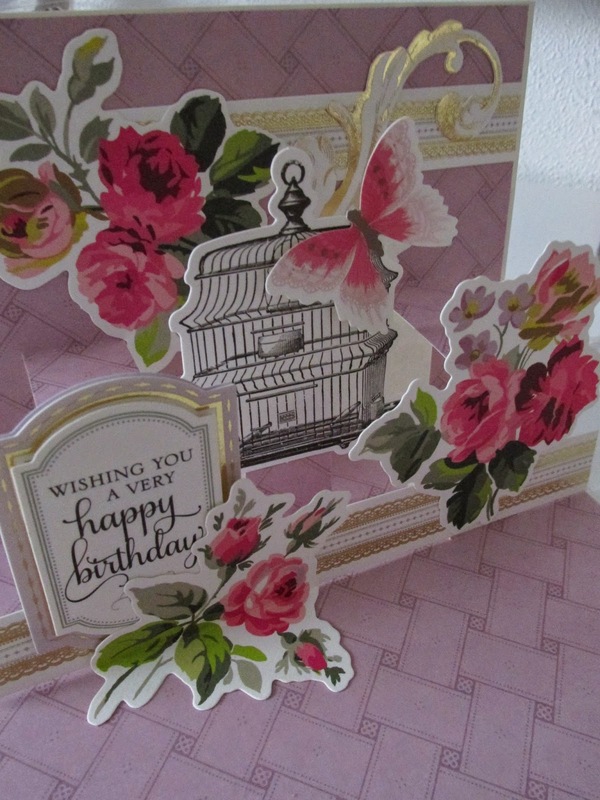 Hi bloggers, this week I wanted to share with you this new card creation inspired by Anna griffin. Anyone who is a massive fan of Anna Griffin will know that she has been on QVC UK for the past 2 days and one couldn't miss out on the shows. Now I have to say that I was very good in that I didn't order anything this time (trust me I was tempted!) but instead I was just inspired by her recent creations. Anna has just released a new card kit that allows you to make 3D pop up cards. Since I had already bought several of her card kits in the past I decided to give this one a miss but I thought how hard could it be to create my own. It turns out not very hard at all and I can see this as a new favourite card template for future occasions. So I decided on the Grace paper collection as I think this is the prettiest of all Anna Griffin collections, plus I have lots of embellishments to compliment it. I cut out my pop up template and adhered it into a 5" x 7" landscape card. I then added the embellishments and wholah... beautiful card! 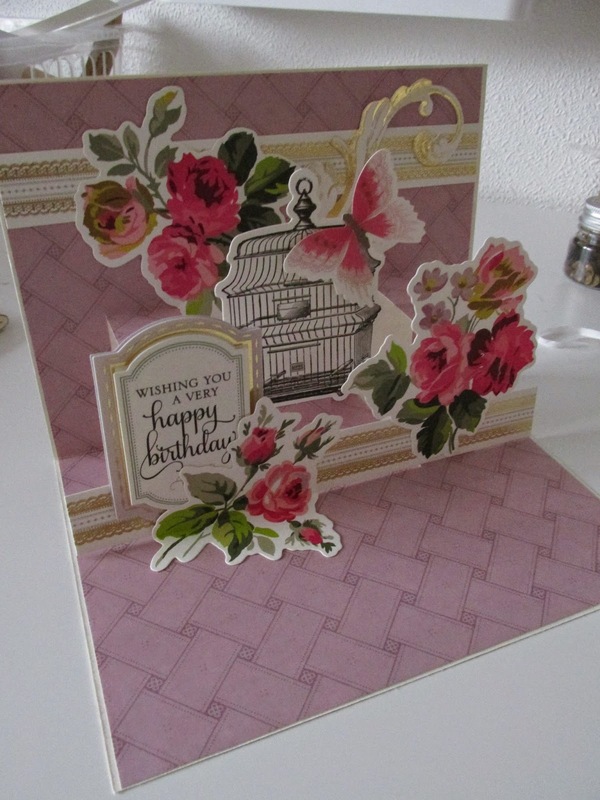 The above picture shows the front of the card using one of Anna's birthday stamps and then adding a paper border. I'm hoping to host a Vintage Greeting Card workshop in the Spring so I think this card template will definitely be on the list as well as a few other card template designs I'm looking into. Check out my 'Beautiful Cards' board on Pinterest for a few previews of some of the ideas I'm considering. If you've missed Anna Griffin so far on QVC UK, there is one last chance to catch her tonight at 10pm, so don't miss out! I really appreciate this tutorial.. I found some pop up 3d cards on http://popupcards.net. They are the biggest wholesale pop up cards in Viet Nam. I really like how youve combined the CAS exterior with the interesting pop-up interior. Very cool. Why dont choose the best Pop Up Cards Supplier for you. Get it on http://popupcard.net.. 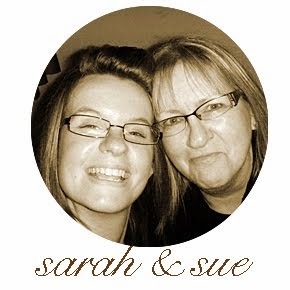 This is the company who sell bulk of handmade pop-up cards.